In my last post I argued for the moral seriousness of clerical infidelity. It may seem amazing that this would be necessary, but it is; the urge to instrumentalise these tragic cases to undermine the discipline of clerical celibacy is so strong, that liberals, who would normally be enraged by male authority figures taking advantage of vulnerable women before moving on to another victim, come over all indulgent and say that the Church is cruel to them in asking them to fulfil the vows which these men, presumably voluntarily, undertook. Is the bishop speaking for himself, or is he speaking on behalf of those blackmailing him? Is there truly such thing as a "moderate" bishop, or is he being "moderated" by the enemies of the Church out of fear that his duplicitous behavior will be revealed? Let me spell it out a bit more. Bishop Conry was famous for his ‘liberal views’. Reading some of his remarks with the benefit of hindsight, it is impossible not to see his various women-folk behind his shoulder. Their influence can take a number of slightly different forms. Allow me to interrupt the flow of appalling revelations about Bishop Kieran Conry with some good news! 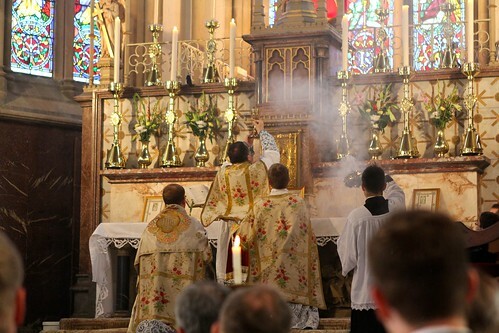 Yesterday the Institute of Christ the King Sovereign Priest, a priestly institute committed to the Traditional Mass, took formal possession of the stunning historic church of St Walburge's in Preston, with a splendid Mass in the presence of Bishop Michael Campbell of Lancaster, the Ordinary. I couldn't make it, sadly, but here are some photographs taken by Martin Gardner: his complete album of the occasion can be seen here. St Walburge's is not just large and a nice old church - it is staggering, one of the gems of Catholic architecture in England. 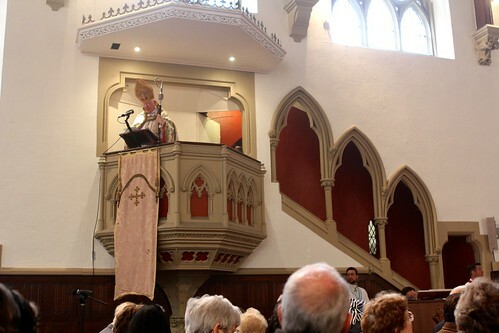 Bishop Campbell, who assisted at the Mass and preached from the fabulous pulpit. Mgr Gilles Wach, centre, is the Superior of the Institute of Christ the King Sovereign Priest. 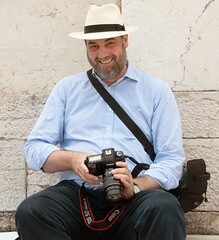 He is French, although the Institute's seminary is in Italy, near Florence. 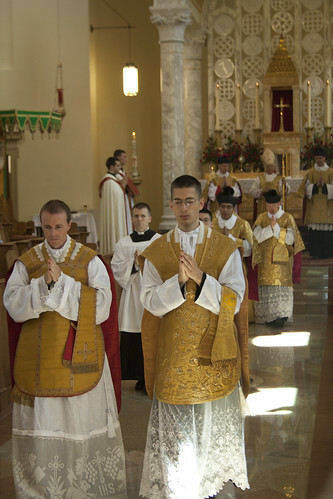 To his right (on the left of the photo) is the Rev Scott Tanner, a Institute seminarian who hails from Reading, currently a transitional deacon. 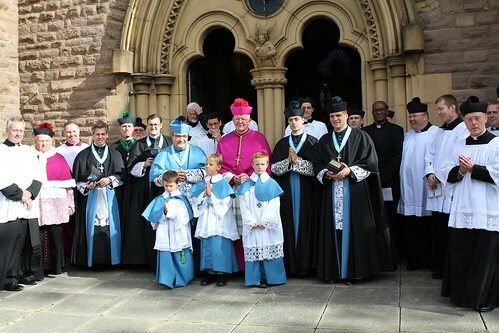 Bishop Campbell is in purple in the centre, Mgr Wach in blue next to him. 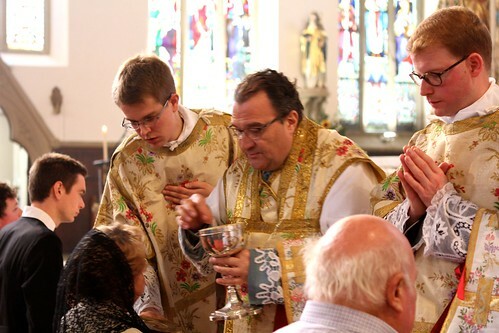 To the right of Mgr Wach (going left, in the picture) are two priests of the Institute: the recently ordained Canon Francis Altiere, who was with the LMS on the Walsingham Pilgrimage, and Canon William Hudson. 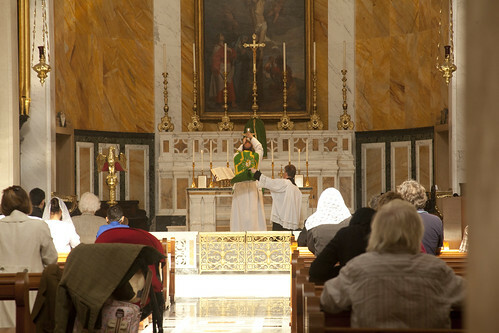 Canon Altiere, an American, is going to be the shrine custodian at St Walburge's. 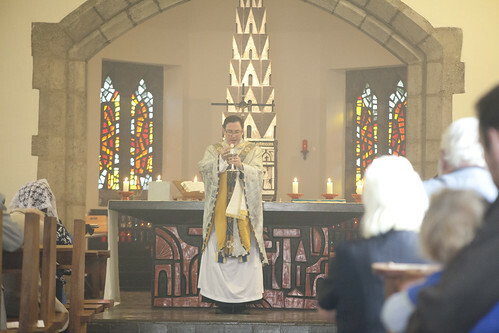 Canon Hudson is currently the only English priest of the Institute; he is based in Brussels. Although the letters do not disclose a sexual relationship, the affair lasted more than a year and involved the married woman spending at least three nights at the bishop's detached property in Pease Pottage, West Sussex. The Mail on Sunday has also seen a love letter from the bishop to a second woman, whose name we are not publishing for legal reasons. The bishop insisted that the affair with the mother of two was not the reason for his resignation. He said he had quit over a different relationship. His statement, to be read in parishes in his diocese this weekend, from the diocesen news blog. This is an excellent presentation of the apostolate of the Institute of Christ the King Sovereign Priest in New Brighton: the history of the church, the purpose of the shrine and so on. It even has me in it! 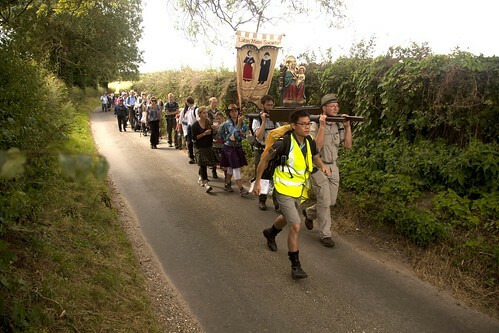 And footage of the LMS Pilgrimage there which took place in August. The Dome of Home from Philip Chidell on Vimeo. Forgiveness is never impossible. You just need to repent and queue up here. I knew Cristina Odone had some odd views on divorce, and I even referred to them the other day, but I was taken aback by this passage in an article by her in the Telegraph. How can my Church bar Suzanne, a friend whose husband spent the nights at his laptop, gambling away the family’s income? If she had not divorced him, after his broken promises to reform added up to nought, she risked her children’s future. Surely no priest can say she’s guilty of breaking God’s law? Nor is Suzanne’s case the worst: one priest, who offered to give me communion despite Church rulings, knew battered wives who’d finally found the courage to divorce their abusers – only to realise they would be divorcing their Church as well. Is it possible that she is so muddle-headed that she thinks the Church bars people from Holy Communion for separating from an abusive spouse? Michael Davies died ten years ago today. The Conference and Requiem Mass in his honour is taking place on Saturday 4th October in St Mary Moorefields, London: details and booking here. The Requiem will be High with a professional choir singing some great polyphony; the celebrant will be Fr Anthony Conlon. It will be at 4:15pm and anyone can turn up to that. 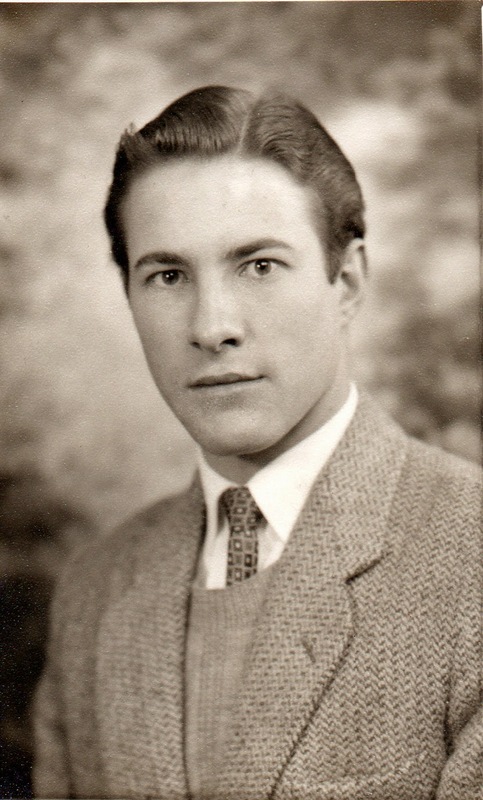 I was just becoming active in the Latin Mass Society at the time of his death, and sadly I never met him. 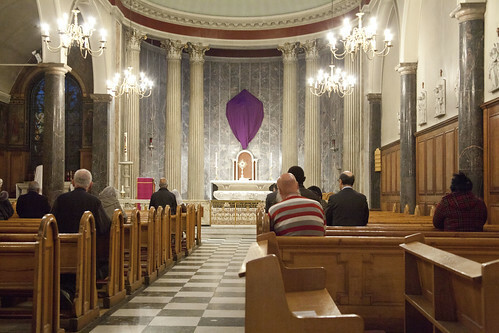 But like so many people attracted to the Traditional Mass, one of the first things I did after chatting to some trads was, on their recommendation, to read Michael Davies' great trilogy, 'Liturgical Revolution' (Cranmer's Godly Order, Pope John's Council, Pope Paul's New Mass), which I can still recommend to everyone. Like all his works it is clear, thorough, and fair-minded. It opened my eyes to a perspective on the crisis in the Church which had been hidden from me up to then. Extensive further reading over the following years has confirmed the truth of it. There is an excellent appreciation of him on Rorate Caeli. I include below, from it, the note sent by Cardinal Ratzinger when he learned of Michael's death. Say a prayer today for him. Requiem aeternam dona ei Domine, et lux perpetua luceat ei. 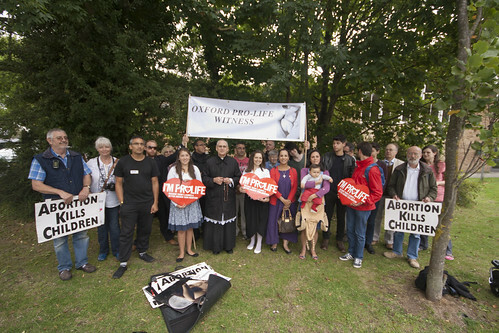 The Oxford Pro-Life Witness takes place this Saturday as usual, from 3 to 4pm. The location is outside the Catholic Church of St Anthony of Padua, Headley Way, Oxford OX3 7SS (click for a map). 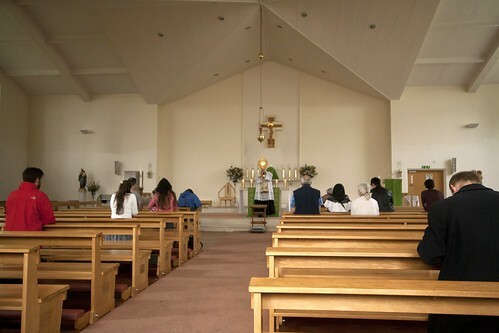 We pray the Rosary by the road, while some of us watch before the Blessed Sacrament in the church. 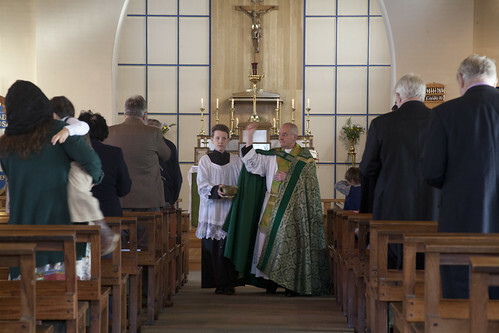 The witness is normally led by Fr John Saward, priest in charge of the neighbouring parish of SS Gregory & Augustine's. In recent months we have been blessed by a counter-demonstration, who play loud music, and, until the police intervened, tried to hide our displays with sheets. 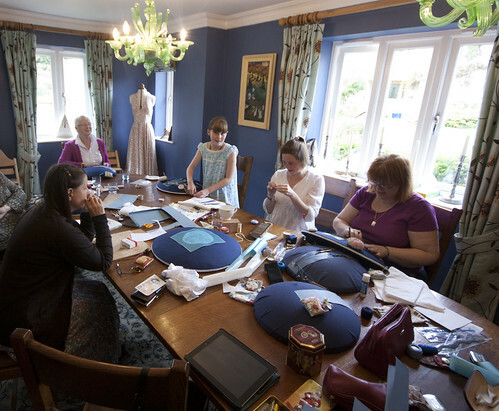 We outnumber them three or four to one; they have boosted our numbers enormously, as well as our determination. They, at any rate, seem convinced that we are a force against abortion which is worth opposing. 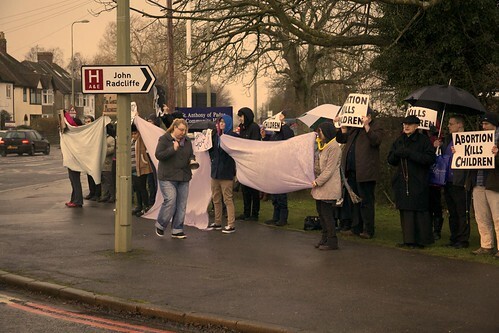 And all we are doing is saying the Rosary, outside an empty abortion facility: the nearby John Radcliffe Hospital, where abortions do not take place on Saturdays. Exposition is concluded with a brief Benediction. It is easy to despair of the pro-Life cause, which has been going on for forty years with, apparently, little to show for it. But where the effort and the prayers go in, we have our successes. The closure of the Bedford Square clinic in London shows what is possible. Hoc genus in nullo potest exire, nisi in oratione et jejunio. The pro-abortionists efforts to prevent us being seen, back in January 2014. The Pope has appointed a commission to look into the annulment process, with a view to its simplification. They may come up with some good ideas: training, funding, dealing with delays and backlogs, and better marriage preparation. As a way of solving the 'Communion for the Divorced' issue, however, it is fraught with difficulties. I've mentioned them before on this blog (and here), here is an aide memoir. 1. Quicker and easier annulments are not what the progressives are asking for. 2. Quicker and easier annulments undermine the certainty that the subsequent marriage is valid. If the confidence of the Faithful in the annulment process is undermined, we will end up in a situation in which those who have been through the process and remarried are regarded, explicitly or not, as in a dubious or second-class situation. They won't get what they actually want, a publicly recognised valid new marriage, unless the process of annulment is seen by everyone as serious. Did I say 'we could end up...?' Sorry, in places where the annulment process has been speeded up successfully, we've already arrived. 3. Quicker and easier annulments undermine Catholic marriages. Since annulments are not considered until after a civil divorce, the prospect of an easy annulment will encourage people in rocky marriages to split up. They may also be influenced by the idea that, since apparently so few marriages are valid, theirs might not have been. It's not exactly an unusual sight, particularly over the Summer, but it is worth mentioning because these were in fact pilgrims, making a carefully planned tour of some of England's holy places under the care of a priest of the Fraternity of St Peter, Fr Michael Stinson, and a Fraternity seminarian, James Mawdsley. The pilgrimage was organised by Syversen Touring. 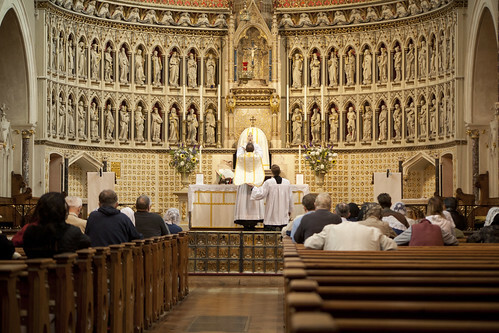 They joined the LMS Pilgrimage to Walsingham (to the extent that their delayed flight permitted), and I caught up with them in the Oxford Oratory, for Low Mass, before joining them for lunch. They were about to go to Littlemore. 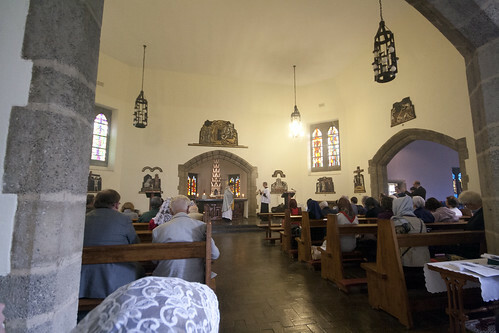 The Latin Mass Society was delighted to make a small practical contribution to their pilgrimage, and we'd be more than happy to do this again. 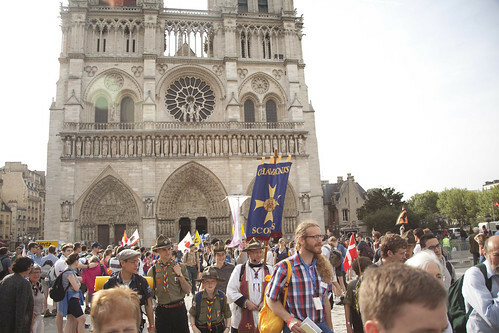 Traditional Catholics from all over the world are more than welcome to our events and the many spiritual and historical riches of Catholic England. That's what Fr John Zuhlsdorf says: it will end by the end of Septemeber. According to my sources, which are probably the same as his, this is true. 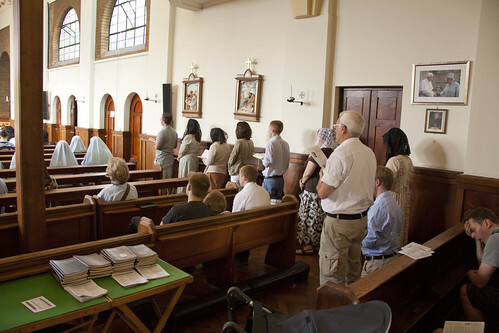 It was announced from the pulpit yesterday by the new Parish Priest, Fr Steven Fisher. It was his second Sunday in the parish. 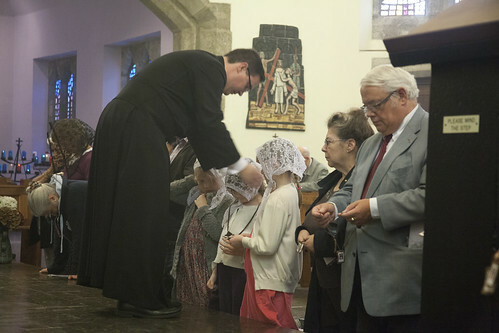 If it isn't true, no one will be more pleased to put the record straight than I.
Archbishop Peter Smith of Southwark did something very unusual in moving Fr Tim Finigan from the parish of Our Lady of the Rosary at Blackfen, to a parish in Margate. 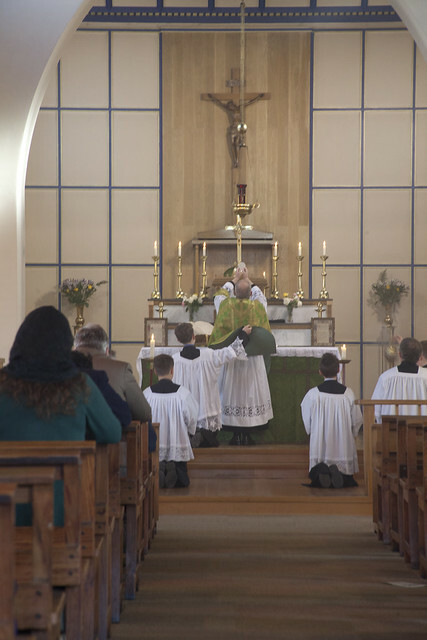 The usual thing is that, knowing that there was a long-established group attending the Traditional Mass in the parish, Archbishop Smith appointed a new Parish Priest who was able, and professed himself willing, to carry this on. It is a tragedy that this hasn't worked. Fr Fisher has decided, for reasons which I'll leave to him to explain, that, having said he would continue to say the EF, he won't after all. 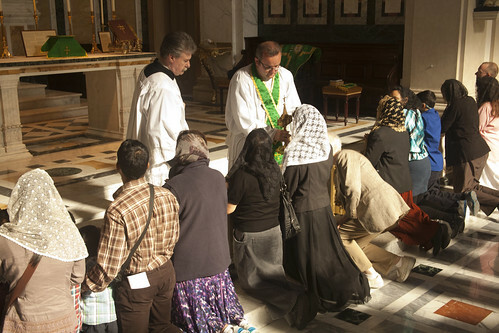 Photos: a Mass celebrated in Our Lady of the Rosary in happier times. Set here. How to annoy a Jansenist. 1 Have lots of processions. The days roll by, and Michael Sean Winters doesn't get round to correct the spelling of 'Damien Thompson' in his post about Jansenists and Jesuits. By the time you read this, it may have happened, but it is taking a mighty long time, even after Damian himself pointed out the error in the comments box. 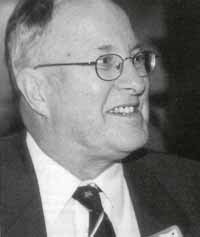 Thompson fails to see that the Holy Father, above all, is engaged in an old struggle for the Society of Jesus: He is confronting the Jansenists of our day, the very same conservative Catholics in the English-speaking world whom Thompson thinks have the fire of the Gospel in their bellies. It is not the Gospel, but a hyper-moralistic concern against spiritual contagion that animates the conservatives Thompson champions. And, quite clearly, this is not what animates Pope Francis. Has Winters even looked up Jansenism in a reference book? He doesn't appear to have a clue about it. They were not 'conservative Catholics': they were crypto-Calvinist heretics. Leaving the matter at the level of the cartoon history of the Church, the Jansenists were an 18th century group of Catholics, eventually condemned by the Pope, and who eventually formed a schismatic Church in the Netherlands, characterised by a kind of crypto-Calvinism. This manifested itself in the rejection of free will and the notion of cooperation with grace, on which subject they quickly became locked in a ferocious pamphlet war with the Jesuits. The Jansenists included some brilliant polemicists, notably recruiting Blaise Pascal to their cause. The notion of unscrupulous Jesuits working out how to avoid the moral law owes more to these guys than to English or German Protestant polemicists of the 16th and 17th century. Sung Mass at 1.30pm, followed by a break for refreshments, a talk, Rosary and Benediction, and clothing with the Brown Scapular. Click here for a map. There is a coach from London: email the LMS Office for details. The complex was a Medieval Carmelite Priory, where St Simon Stock spent time. He may well have had his vision of the Brown Scapular here, and it is the world centre for this devotion. We have our Mass in the Relic Chapel, where his skull is preserved and can be venerated. Our pilgrimage always includes the clothing of candidates with the Brown Scapular. 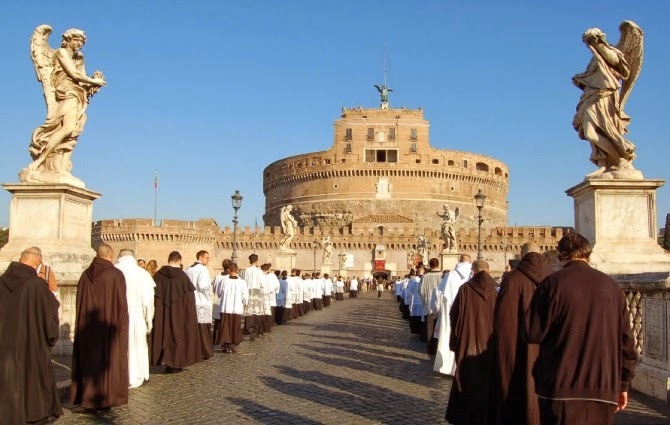 It came back into the hands of the Carmelites in the 20th century, and much of the artwork and architectural style dates from immediately after the 2nd World War. Last year a Missa Cantata was celebrated for us by Fr Marcus Holden, and accompanied by some excellent polyphony. Time is running out to book on this pilgrimage, please don't leave it till the last minute! The deadline is 10th September. 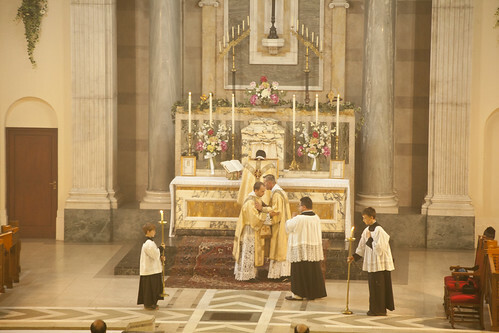 Organised by an international group of friends of the Traditional Latin Mass (The Cœtus Internationalis Summorum Pontificum), this annual Summorum Pontificum Pilgrimage to Rome is at the same time an act of gratitiude to the Holy See for the landmark recognition in 2007 of the legitimate legal, moral and pastoral status of the Old Rite, and also a reminder that the Traditional Mass is here to stay and has so much more to offering restoring the Faith in the wider Church. I've been asked to spread the word. CITIZENGO (CGO), A NON-PROFIT FOUNDATION, IS SEEKING A CAMPAIGNER - COUNTRY MANAGER, UNITED KINGDOMTO JOIN OUR GLOBAL LEADERSHIP TEAM AND PROVIDE STRATEGIC OVERSIGHT AND MANAGEMENT TO OUR FAST-GROWING UK COMMUNITY OF ACTIVE CITIZENS. 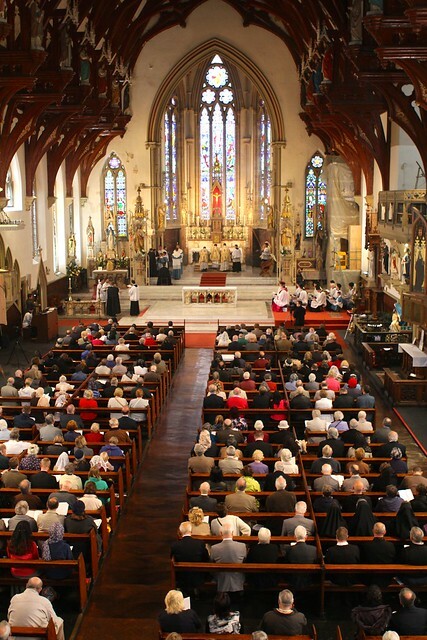 High Mass at 12 noon, to be celebrated by our Northern Chaplain, Fr Michael Brown. 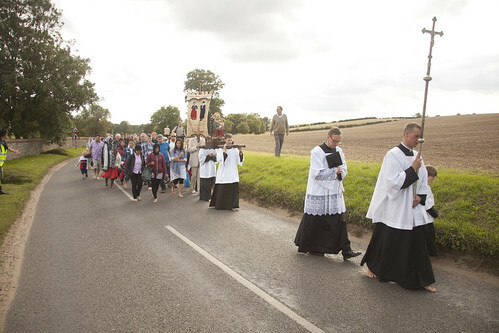 Yesterday took place the Latin Mass Society's revived 'Tyburn Walk', the traditional devotional walk from the place of imprisonment to the place of execution for 105 Catholic martyrs during penal times. It starts beween St Sepulchre's Church (on one side of the street), and the site of Newgate Prison (on the other side), where the Old Bailey stands. We gathered there around Fr Nicholas Schofield, who is not only the LMS Chaplain for the South East, but a published historian, and very well informed about the English martyrs. 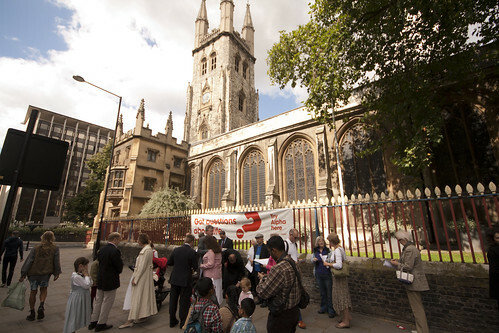 We walked up Holborn to St Giles Church, the historic church where the condemned were traditionally given a cup of ale. We said a decade of the Rosary there. 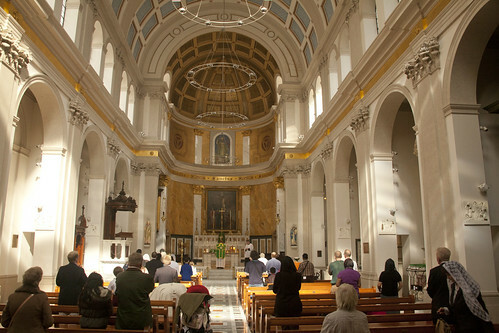 We then went to the Catholic church of St Patrick's Soho Square, where Fr Schofield celebrated Low Mass for us, thanks to the hospitality of the parish priest Fr Alexander Sherbrooke. We also venerated a relic of St Oliver Plunket, who was the last, as well as the most senior, Catholic martyr to die at Tyburn: the Achbishop of Armagh and Primate of Ireland, caught up in the fictitious 'Titus Oates' plot. After St Patrick's, we were on Oxford Street, where the crowds were denser. 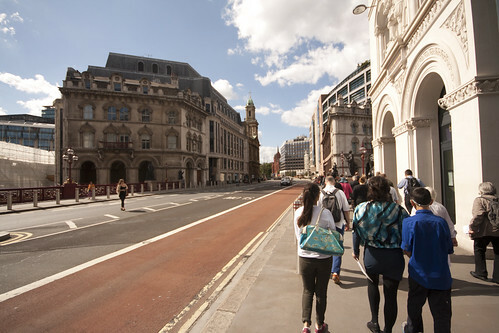 However walking here was no more difficult for us than for any of the other pedestrians. There were about 45 of us, but we didn't march in close formation, we just walked along like everyone else. 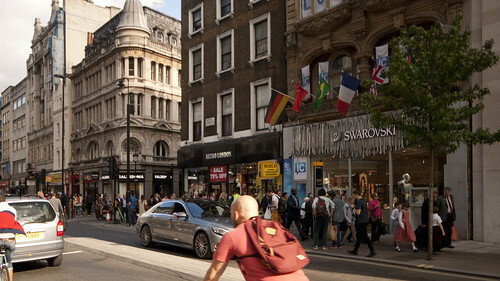 The problem of disrupting the shoppers or traffic really didn't arise. 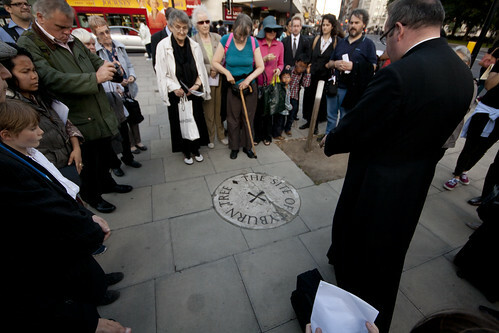 At Marble Arch we said a final decade of the Rosary at the plaque in the ground marking the site of the Tyburn Tree, the infamous gallows, before going to the Tyburn Convent for Benediction. 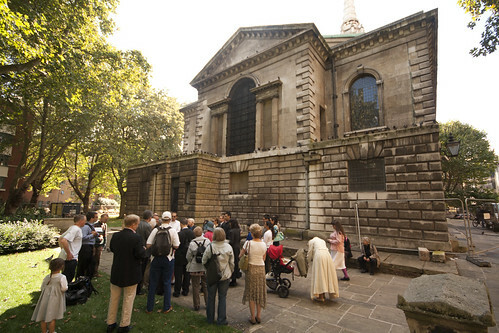 The Tyburn Walk was for many years organised by the Guild of Our Lady of Ransom, and in the early and mid 20th century was a major event, with more than a thousand Catholics taking part. 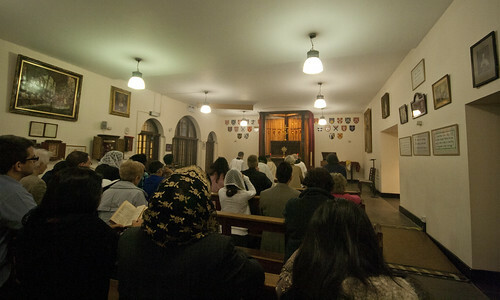 The traffic was stopped and they had benediction at the end from the balcony of the convent. It was finally discontinued in 2007. Appropriately, our chaplain yesterday, Fr Nicholas Schofield, is a member of the Guild's Executive Committee.